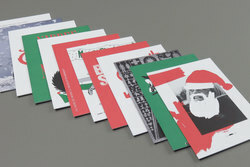 Various Artists - Friends of Shaun Christmas Cards. Bleep. Friends of Shaun Christmas Cards pay tribute to Shaun Bloodworth. Friends of Shaun are a group of creative folk who worked with Shaun. Having come together last year to organise an auction and a series of events in Sheffield and London to raise money for the Bloodworth family, they have come back together to create the Friends of Shaun Christmas Cards. 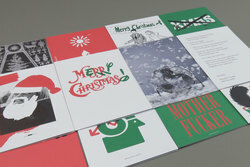 The Designers Republic and Give Up Art are among 12 artists, designers and photographers who’ve contributed to a pack of Christmas cards, raising money in memory of Sheffield-born photographer Shaun Bloodworth. Having taken portraits of everyone from John Simpson to John Shuttleworth, Shaun's work also features in the National Portrait Gallery’s collections. His interest in underground music led to him collaborating with Mary Anne Hobbs for classic images of artists including Benga, Skream and Hudson Mohawke that have been seen around the world. 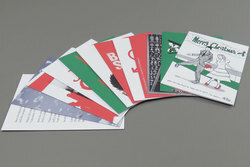 Shaun also took the images of that were the basis for our Green Series imprint that ran between 2012 and 2013 and the North East South West compilation. Shaun passed away in 2016 after spending the last four months of his life in Sheffield’s Northern General Hospital, waiting for a liver that didn’t arrive in time. 100% of the money raised will be donated to the Northern General’s transplant department. Others who have donated time and talents to Friends of Shaun fundraisers so far include: The Black Dog, Pipes, Kid Acne, Florence Blanchard, Oris Jay, Pho-Ku Sound System, Warp Records, CPU Records, Mary Anne Hobbs, Bleep, Boiler Room, Ernest Wright and Son, RinseFM, Theo Simpson, Martin Simpson, Richard Hawley, Tom J Newell, Kojo and Lee, Graham Fellows (AKA John Shuttleworth).